Childhood is full of magic. Sometimes, the wild creatures of the earth seem to sense a kinship with children, and allow them a closer look than we grown ups will ever be allowed. 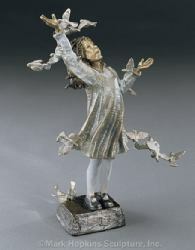 This lovely girl is caught up in both a physical and an emotional swirl, as a flock of birds take wing around her. Among this Circle of Friends, it is hard to tell who is the most enchanted.